It's the truth. Slow players get left behind - in every sport and all ages. If you're serious about performance, you need effective equipment to maximize your effort. Don't make training any harder than it already is. Stop struggling with piles of faded, cracked cones scattered everywhere. This shouldn't be hard. Our bright cones can't be missed - and they won't trip you up. When you're done for the day, stack them up and stip them back in the bag for easy carrying and storage. 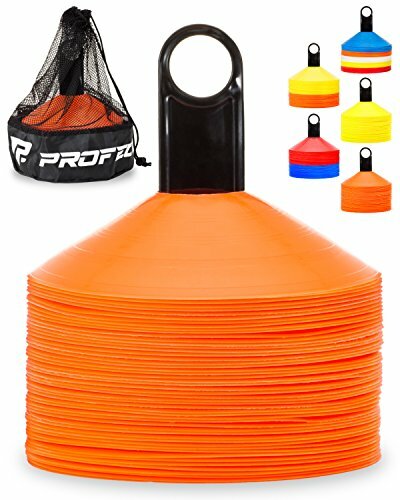 ULTIMATE TRAINING SET - The only agility disc cone set that includes 50 Pro Disc Cones, mesh carrying bag, cone holder, and Bonus "Top 15 Speed and Agility Cone Drills" eBook. BUILT TO LAST - Durable and flexible. Our long-lasting soccer cones will bounce back after getting stepped on, kicked, and run over season after season. Great as boundary markers, sport practice, and targets. HIGH VISIBILITY COLORS - Bright, easy-to-see colors with UV protection to clearly mark anything. On the field, court, gym, track, sidelines, or parking lot. A great gift idea for kids, coaches, athletes, or anyone else who loves sports! UNMATCHED QUALITY - Our premium, soft, low-profile sport cones are approved by coaches, kids and parents. Ideal for soccer training equipment, coaching, drills, practice, football, basketball, dribbling, obstacle courses, or even drone racing gates. 100% MONEY-BACK GUARANTEE - Profect Sports offers a 100% guarantee that you are fully satisfied with your Pro Disc Cones or receive your money back. Hit "Add To Cart" now. If you have any questions about this product by Profect Sports, contact us by completing and submitting the form below. If you are looking for a specif part number, please include it with your message.